Con la impresora Zebra ZD620 es para cuando usted necesita imprimir calidad, productividad, flexibilidad en sus aplicaciones y manejabilidad es la siguiente generacion para equipos de transferencia termica reemplazando la popular serie GX y el modelo ZD500, llevando los equipos de escritorio convencionales con calidad de impresion premium, proporcionando la mejor calidad con las mejores caracteristicas de la industria. Este modelo esta diseñado para cumplir con una gran variedad de aplicaciones, con una interface de de usuario de hasta 10 botones con una pantalla LCD que le hara mas facil la instalacion y el estado. La ZD620 corre link-OS y esta soportado por nuestra poderosa suite de aplicaciones Print DNA. 203dpi TT USB HOST BTLE Ethernet CUTTER. AIT, Impresora, TT,STANDARD EZPL 203dpi, US CORD, USB. AIT, DT PRINTERSTANDARD EZPL, 203dpi, US CORD, USB. AIT, DT PRINTER STANDARD EZPL, 203dpi, US CORD, USB, USB HOST, BTLE, SERIAL, Ethernet. AIT, DT PRINTERSTANDARD EZPL, 203dpi, US CORD, USB, USB HOST, BTLE, SERIAL, Ethernet. AIT, DT PRINTER STANDARD EZPL, 203dpi, US CORD, USB. 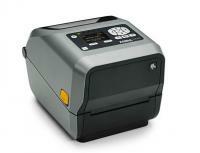 DT Printer4" 203dpi US Cord, USB, USB Host, BTLE, Serial, Ethernet, EZPL, Dispensador (peeler). AIT, Impresora, TT, STANDARD EZPL 203dpi, US CORD, USB. AIT, TT PRINTER STANDARD EZPL 203dpi, US CORD, USB, USB HOST, BTLE, SERIAL, Ethernet. AIT, Impresora, DT,STANDARD EZPL, 203dpi, US CORD, USB, USB HOST, BTLE, SERIAL, Ethernet. AIT, DT PRINTERSTANDARD EZPL, 300 dpi, US CORD, USB, USB HOST, BTLE, SERIAL, Ethernet. AIT, Impresora,DT, STANDARD EZPL, 203dpi, US CORD, USB, USB HOST, BTLE, SERIAL, ETHERNET, LINERLESS con TAKE LABEL SENSOR. AIT, Impresora, DT, STANDARD EZPL, 203dpi, US CORD, USB, USB HOST, BTLE, SERIAL, Ethernet. AIT, DT PRINTER STANDARD EZPL, 300 dpi, US CORD, USB, USB HOST, BTLE, SERIAL, Ethernet. AIT, TT PRINTERSTANDARD EZPL 203dpi, US CORD, USB, USB HOST, BTLE, SERIAL, Ethernet. AIT, Impresora, TT,STANDARD EZPL, 203dpi, US CORD, USB, USB HOST, BTLE, SERIAL, Ethernet, Dispensador (PEELER). DT Printer 4" 300 dpi US Cord, USB, USB Host, BTLE, Serial, Ethernet, EZPL, Dispensador (peeler). DT Printer4" 300 dpi US Cord, USB, USB Host, BTLE, Serial, Ethernet, EZPL, Dispensador (peeler). AIT, Impresora, TT, STANDARD EZPL 203dpi, US CORD, USB, USB HOST, BTLE, SERIAL, Ethernet. 300 dpi USB HOST BTLE Ethernet. AIT, Impresora, TT,STANDARD EZPL 203dpi, US CORD, USB, USB HOST, BTLE, SERIAL, Ethernet. AIT, Impresora, DT,STANDARD EZPL, 203dpi, US CORD, USB, USB HOST, SERIAL, Ethernet, 802.11, Bluetooth USA/CANADA. DT Printer 4" LCD, 300 dpi, US Cord, USB, USB Host, BTLE, Serial, Ethernet, EZPL. AIT, Impresora, DT, STANDARD EZPL, 203dpi, US CORD, USB, USB HOST, SERIAL, Ethernet, 802.11, Bluetooth USA/CANADA. DT Printer4" LCD, 300 dpi, US Cord, USB, USB Host, BTLE, Serial, Ethernet, EZPL. DT Printer4" 203dpi US Cord, USB, USB Host, BTLE, Serial, Ethernet, EZPL, Cutter. DT Printer 4" 203dpi US Cord, USB, USB Host, BTLE, Serial, Ethernet, EZPL, Cutter. AIT, Impresora, DT,ZD620; STANDARD EZPL, 203dpi, US CORD, USB, USB HOST, BTLE, SERIAL, ETHERNET, LINERLESS con CUTTER y TAKE LABEL SENSOR. AIT, Impresora, TT,STANDARD EZPL, 300 dpi, US CORD, USB, USB HOST, BTLE, SERIAL, Ethernet, Dispensador (PEELER). AIT, Impresora, TT, STANDARD EZPL, 300 dpi, US CORD, USB, USB HOST, BTLE, SERIAL, Ethernet. AIT, Impresora, TT,STANDARD EZPL, 300 dpi, US CORD, USB, USB HOST, BTLE, SERIAL, Ethernet. DT Printer4" 300 dpi US Cord, USB, USB Host, Serial, Ethernet, 802.11ac, Bluetooth, EZPL. AIT, Impresora, DT, LOCKING, STANDARD EZPL, 203dpi, US CORD, USB, USB HOST, BTLE, SERIAL, Ethernet. 203dpi TT USB HOST 802.11, Bluetooth. DT Printer 4" 300 dpi US Cord, USB, USB Host, BTLE, Serial, Ethernet, EZPL, Cutter. DT Printer4" 300 dpi US Cord, USB, USB Host, BTLE, Serial, Ethernet, EZPL, Cutter. AIT, Impresora, DT,LCD; STANDARD EZPL, 203dpi, US CORD, USB, USB HOST, BTLE, SERIAL, ETHERNET, LINERLESS con CUTTER y TAKE LABEL SENSOR. AIT, Impresora, DT,LCD, STANDARD EZPL, 203dpi, US CORD, USB, USB HOST, SERIAL, Ethernet, 802.11, Bluetooth, Dispensador (PEELER) USA/CANADA. 300 dpi USB HOST 802.11, Bluetooth. AIT, Impresora, DT,Health care, LCD, STANDARD EZPL, 203dpi, US CORD, USB, USB HOST, SERIAL, Ethernet, 802.11, Bluetooth USA/CANADA. AIT, Impresora, TT,STANDARD EZPL 203dpi, US CORD, USB, USB HOST, SERIAL, Ethernet, 802.11, Bluetooth USA/CANADA. DT Printer 4" LCD, 300 dpi, US Cord, USB, USB Host, Serial, Ethernet, 802.11ac, Bluetooth, EZPL. AIT, Impresora, TT, STANDARD EZPL 203dpi, US CORD, USB, USB HOST, SERIAL, Ethernet, 802.11, Bluetooth USA/CANADA. AIT, Impresora, TT, STANDARD EZPL, 203dpi, US CORD, USB, USB HOST, BTLE, SERIAL, Ethernet, CUTTER. 300 dpi USB HOST BTLE Ethernet CUTT. DT Printer4" LCD, 300 dpi, US Cord, USB, USB Host, Serial, Ethernet, 802.11ac, Bluetooth, EZPL. AIT, Impresora, TT,STANDARD EZPL, 203dpi, US CORD, USB, USB HOST, BTLE, SERIAL, Ethernet, CUTTER. AIT, Impresora, DT,LOCKING, STANDARD EZPL, 203dpi, US CORD, USB, USB HOST, BTLE, SERIAL, Ethernet. AIT, Impresora, TT,LCD; STANDARD EZPL, 203dpi, US CORD, USB, USB HOST, SERIAL, ETHERNET, 802.11, BT, Dispensador (PEELER) USA/CANADA. DT Printer 4" 203dpi US Cord, USB, USB Host, BTLE, Serial, Ethernet, EZPL, Dispensador (peeler). AIT, Impresora, TT, STANDARD EZPL, 300 dpi, US CORD, USB, USB HOST, SERIAL, Ethernet, 802.11, Bluetooth USA/CANADA. AIT, Impresora, DT,LOCKING, LCD; STANDARD EZPL, 203dpi, US CORD, USB, USB HOST, SERIAL, ETHERNET, 802.11, BT USA/CANADA. AIT, Impresora, TT,STANDARD EZPL, 300 dpi, US CORD, USB, USB HOST, SERIAL, Ethernet, 802.11, Bluetooth USA/CANADA. AIT, Impresora, DT, LOCKING, STANDARD EZPL, 203dpi, US CORD, USB, USB HOST, BTLE, SERIAL, Ethernet, CUTTER. AIT, Impresora, DT,LOCKING, STANDARD EZPL, 203dpi, US CORD, USB, USB HOST, BTLE, SERIAL, Ethernet, CUTTER. AIT, Impresora, TT,LCD, STANDARD EZPL, 203dpi, US CORD, USB, USB HOST, SERIAL, Ethernet, 802.11, Bluetooth, CUTTER USA/CANADA. AIT, Impresora, TT,LCD, STANDARD EZPL, 300 dpi, US CORD, USB, USB HOST, SERIAL, Ethernet, 802.11, Bluetooth, Dispensador (PEELER) USA/CANADA. DT Printer 4" 300 dpi US Cord, USB, USB Host, Serial, Ethernet, 802.11ac, Bluetooth, EZPL.